Dr. Armfield with Apollo a rescue dog. Dr. Armfield is proud to be the owner of the Patchogue Animal Hospital which has been established for over 60 years. She grew up in New York always having dogs and cats in her household. Ever since she could remember, her love for animals has inspired her to be a veterinarian. 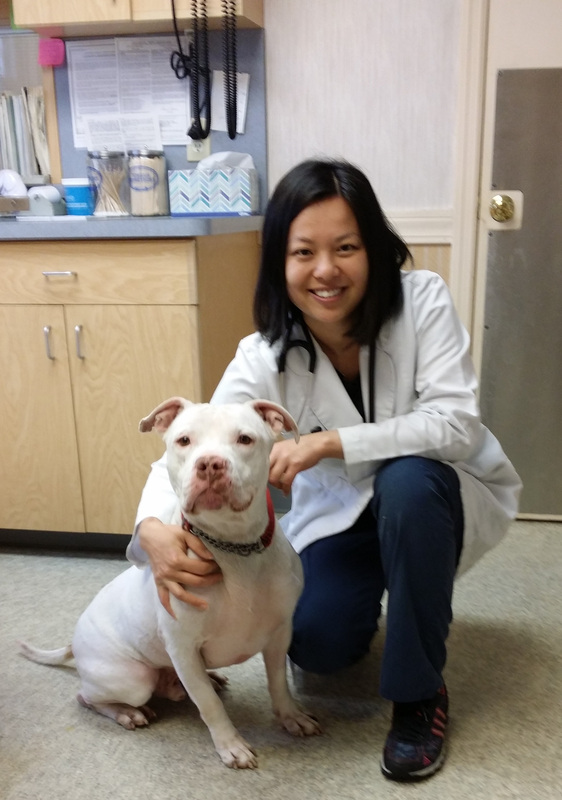 She worked as a veterinary assistant in undergraduate college (University of Rochester) and veterinary school until she obtained her Doctorate of Veterinary Medicine. She graduated from the Iowa State University, College of Veterinary Medicine in 2008. Then she attended the Chi Institute and became a certified veterinary acupuncturist. Afterward, she became trained in holistic medicine and herbal treatment at the Chi Institute. Dr. Armfield is also a certified Stem Cell therapist. Her training allows her to provide alternative treatment to her patients in addition to traditional veterinary medicine. She is a member of several professional associations, including the AVMA (American Veterinary Medical Association), NYSVMS (New York State Veterinary Medical Society), LIVMA (Long Island Veterinary Medical Association), AHVMA (American Holistic Veterinary Medical Association), and IVAS (International Veterinary Acupuncture Society). She is also a member of VIN (Veterinary Information Network) and enjoys consulting with a network of veterinary specialists who are on the cutting edge of medicine. In addition, Dr. Armfield is an USDA accredited veterinarian and can provide International Health Certificates to pets who travel.